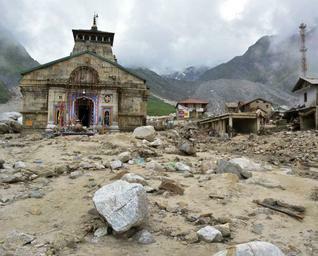 What Might Have Wrecked Such Havoc in Kedarnath? Everyone was waiting eagerly for the first monsoon shower; expecting it to bring some respite from the scorching summer. But what we have been watching in TV news and reading in newspapers for couple of days is not at all pleasing, or I would rather say, extremely disturbing. It was the first rain of this monsoon. And it was 400 percent above average. It simply battered the entire state of Uttarakhand. According to reports, flash flood has taken more than 200 lives so far. Hundreds of buildings and hotels, including 90 dharmashalas (Inn for pilgrims) are washed away by swirling rivers. Massive landslides have disrupted road transportation and communications. Uttarkashi, Chamoli, Srinagar, and Rudraprayag are the worst hit districts. 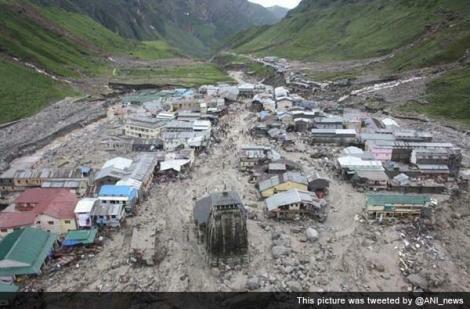 The famous Kedarnath shrine is partially submerged in mud and slush. If we believe government reports, around 50 people have died (as on June 19) in this temporary settlement which remains open from May to October every year. But the actual numbers could be “shocking”; as it is feared that thousands would be buried under 6-7 feet thick debris that had carpeted over the entire settlement area. Other thousands would be washed away in the raging river. After waiting for two days, Indian army has now deployed 55 helicopters to rescue thousands of tourists stranded in the remote pilgrim destination. They could land the first helicopter in Kedarnath on June 20 only. Now they have also deployed Mi-26 Helicopters to bring food, gas, and potable water to worse hit areas. This is one of the largest evacuation operations launched ever in India. Bad weather condition was making it difficult for them to begin rescue operation. Still, it is nearly impossible to reach this tiny hamlet on foot. The entire 14 kms long road that connected Kedarnath to the nearest road-head at Gauri Kund is nowhere to be seen. The Mandakini has engulfed it. There are reports that Kedarnath Yatra (Journey) could begin only after two years. Roads will have to be built. Bridges will have to be erected. People will have to be resettled. And the faith of the people will have to be brought back. The loss of life and property is colossal. Army is just focusing on rescue operation. No one is counting bodies that are strewn all over. Currently, time is too short. Weather is likely to be worse from June 23. I traveled to several places in India and abroad. They all were beautiful. They all were amazing. They all were unique. But Kedarnath has a special place in my heart. A few years back, I had spent days and days and days there; roamed around everywhere; sat on the staircase of Kedarnath shrines for hours watching people come and go by; spoke to traders and porters who come here every May and go back home in October when the shrine closes down for winter; crossed rapids and falls; trekked to Chora Bari glacier from where the river Mandakini originates; walked on its rolling alpine grass barefoot; collected pebbles from every brook that washes the perfectly U-shaped Valley that sets atop at an altitude of 3,500 meters; spent great time with Rajendra Singh Negi – the runner with Kedarnath / Gauri Kund post office, a friendly, talkative and boastful person who stopped at every corner to say ‘Hello’ to someone. Entire Kedarnath was his friend. He accompanied us in our trek to the Glacier. I don’t know if he survived this catastrophe. 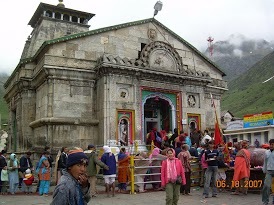 Except Lord Shiva Temple (Kedarnath Shrine), nothing is left in this seasonal settlement. Hundreds of year old temple miraculously escaped the tragedy. But I am still wondering what could be the reason behind such a disaster in Kedarnath? Was it only a cloud burst? Or something else that added to the nature’s fury? No concrete information has come out yet but it is being said that it had been raining for a couple of days and later heavy downpour of unimaginable scale within few minutes caused massive landslides and swept away everything with flood and slush. I am not an earth scientist, but since I had been there, I have some understanding of its physiography. There was a terminal moraine right behind the temple (somewhat 2 kms) formed at the snout of a 7 km long Chorabari Glacier ( altitude from 3800 meters to 6,000 meters) from where the River Mandakini Originates. This terminal moraine has prevented meltwater to flow, resulting in the formation of Gandhi Sarovar Lake. I assume torrential rain and cloud burst might have flooded the lake and caused wreck in Terminal Moraine, resulting in massive flash flood loaded with boulders and mud. It is also to be noted that Kedarnath is part of a biosphere reserve wherein no construction is allowed within its periphery. But over the years, several illegal hotels and pilgrim inns came up that might have interfered with its fragile ecosystem. Now we have nothing left here and it will take years to bring back life to normal. Bursting of Gandhi Sarovar after the wreck in the terminal moraine caused the heavy downstream flow and heavy landslides in the upper region .This was followed by flood and landslides in the lower region.The other reason was of man made . Construction took place against the dip,slope and on the fractured zone ,along with on the river terraces.Huge degradation of fauna , flora and forest increased the intensity of this havock.The whole of the Himalayan region is prone to earthquake ,but still number of Hydroelectric projects have been constructed ,which are still going on.Tons of dynamite are being used for construction of roads and making tunnels ,leading in weakening of the metamorphic and sedimentary formations. You are absolutely right Chaitanya! If you travel to Himachal Pradesh along NH-22, at places, especially after Karcham Wangtu Project, the Sutluj is left to nothing downstream. Secondly, the tunnel has been built to divert the water of Baspa, which ultimately turned the entire region extremely fragile to landslides.